The rally managed to put a postgame smile on Billy Alm’s face, even if the result did not. Polk County came within a couple of feet Friday of making a chaotic bottom of the seventh fall in its favor, but Madison survived a wild last play to hang on to a 5-4 victory over the Wolverines at The Bottoms. The Patriots’ win snapped Polk County’s 22-game winning streak in Western Highlands Conference play, dating back to the 2017 season, and created a three-way tie atop the WHC standings with Mitchell, Polk and Madison. There’s still a lot of conference baseball left, with two-thirds of the WHC schedule remaining. If Friday’s game is any indicator, the race is going to be an exciting one. Madison junior pitcher Kannon Coates had much to do with the Patriots’ good fortune. Coates held Polk County to four hits, with just two of the four runs he allowed being earned, and struck out seven. Three of those came in the first inning after Evan Rimer’s leadoff double. Up 5-3 and working quickly in the bottom of the seventh, Coates got two quick outs before hitting Polk’s Kyler Scruggs. Jordan Bishop followed with a fly ball into the windy air in right field that fell for a double, moving Scruggs to third. Evan Rimer followed with a grounder to short, but the throw to first bounced in the dirt, allowing Scruggs to score. With fans and players from both sides screaming, Alm, coaching third base, waved Bishop toward home as well, but the Patriots were able to corral the loose ball and nail Bishop at home to end the game. Madison grabbed a 1-0 lead in the third inning, loading the bases with no outs on a walk and two errors. Starting pitcher Clark Phipps notched a strikeout before Austin Bowens’ fly ball to left brought in the game’s first run. Phipps then picked off a runner at second to end the inning. Polk immediately responded with two runs in the bottom of the third. Scruggs recorded the first of his two hit-by-pitch at-bats to open the inning, stole second, then moved to third on a passed ball. Bishop’s fly ball to right allowed Scruggs to score. Rimer followed with his second double of the game, moved to third on a passed ball then scored on a wild pitch to make it 2-1. The Wolverines added a run in the fourth as Sedrick Pickett was hit by a pitch to open the inning, with courtesy runner Grant Wooten stealing second and moving to third on Grayson Jones’ single. Wooten lated scored on an infield grounder to up the Polk lead to 3-1. 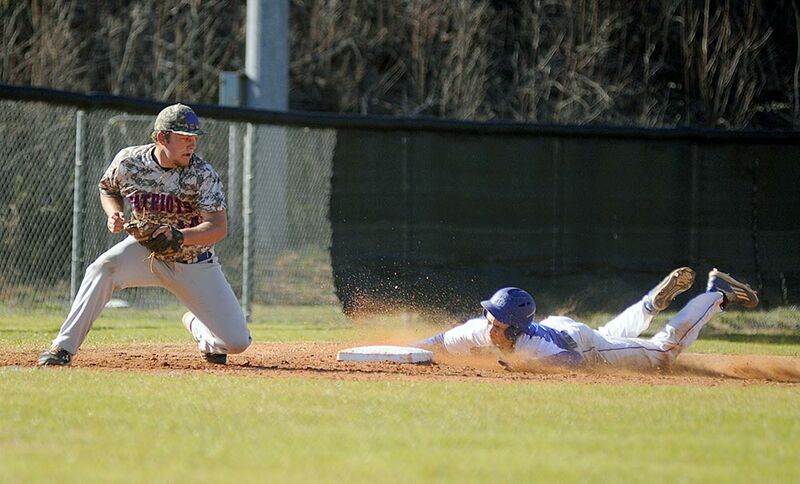 The Patriots made it 3-2 in the fifth on a walk, single and two infield grounders, then erupted for three runs in the top of the sixth, with Trevor Jones’ two-run single highlighting the rally. Phipps allowed four hits and struck out four in five innings. Austin Geagley took the loss, with Zeke Hermann pitching an inning an a third of scoreless relief, striking out two. Rimer finished 2-for-4, with Jones and Bishop providing the remaining base hits. Polk County will step out of conference play on Saturday, making the long trek to Surry County for a doubleheader with Surry Central and East Surry.